We appear recently to be following around the offspring of Brychan, although with a reputed sixty five children, their influence must spread far and wide. 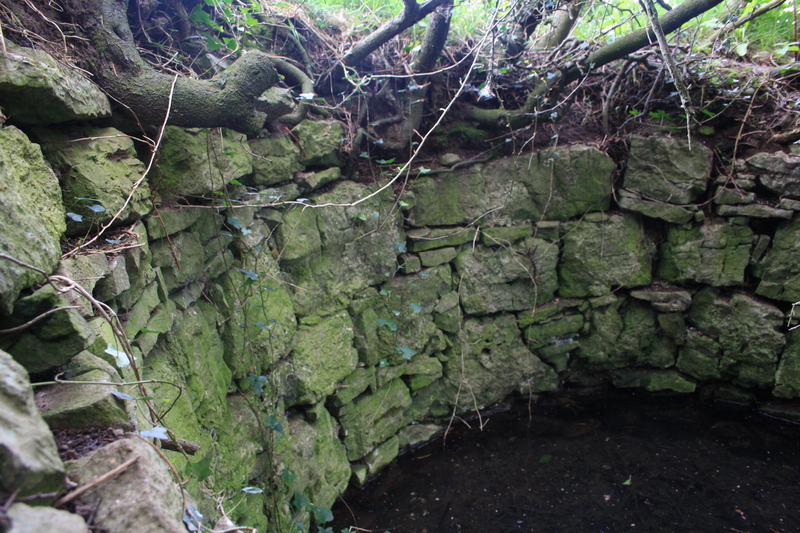 Following on from recent visits to the wells of his daughters Dwynwen and Ceinwen on Anglesey, our latest expedition was to find Ffynnon Gynfran at Llysfaen, close to Colwyn Bay. St Cynfran is given by some authorities as being one of Brychan’s sons, although other sources do not make the connection. However local histories suggest that the first church was erected on the site at some time in the eighth century, the year 777 is rather accurately suggested; which would make it too late to have been founded by a son of Brychan. 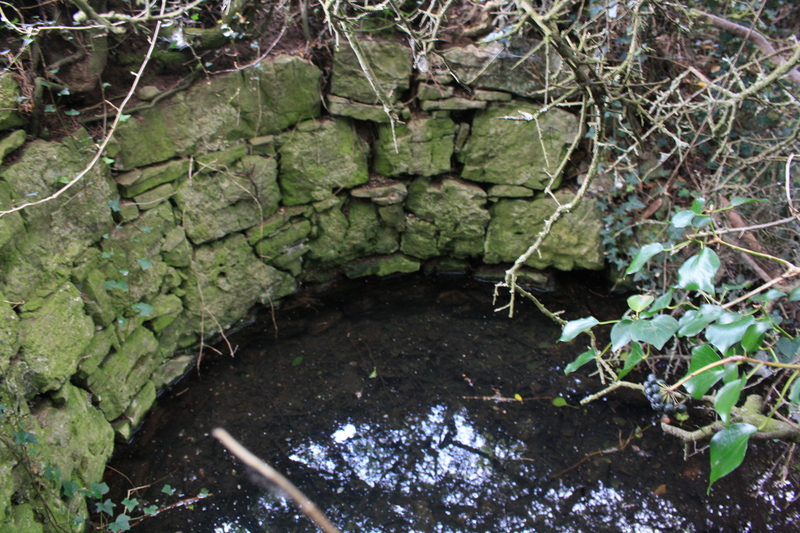 Cynfran’s well is stated to lie around 100 yards to the north of the church. The well I found is marked on recent OS maps as Ffynnon Gynfran, however this is a relatively recent revision, earlier maps before around 1960 marked the site as a well only, without indicating its dedication to Cynfran. 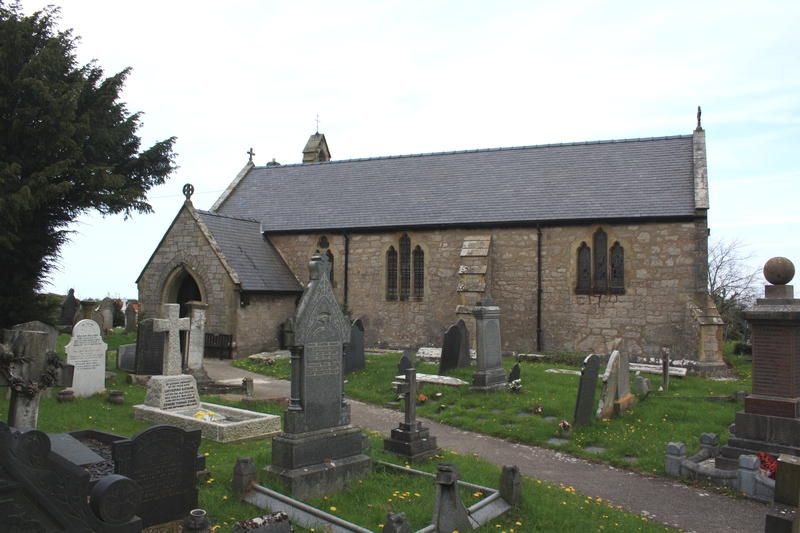 It is interesting to note that a report on the website of Cymdeithas Ffynhonnau Cymru suggest that their members had been looking for a site for the well in the late 1990s and identified a possible site within the grounds of the church. Whether this was a different location or whether the boundaries of the churchyard have changed in the meantime is difficult to say, although it seems unlikely that the well I saw had ever been inside the boundaries of the church yard. For the purpose of this post I shall go with the OS and assume that the well visible at the site is St Cynfran’s well. Presumably this is the site referred to by Cymdeithas Ffynhonnau Cymru as being rediscovered and cleaned in 2002 since it fits the description given on the Royal Commission website, which notes that it was “filled with sludge to ground level” in the 1980s. On this visit the well contained clear water. 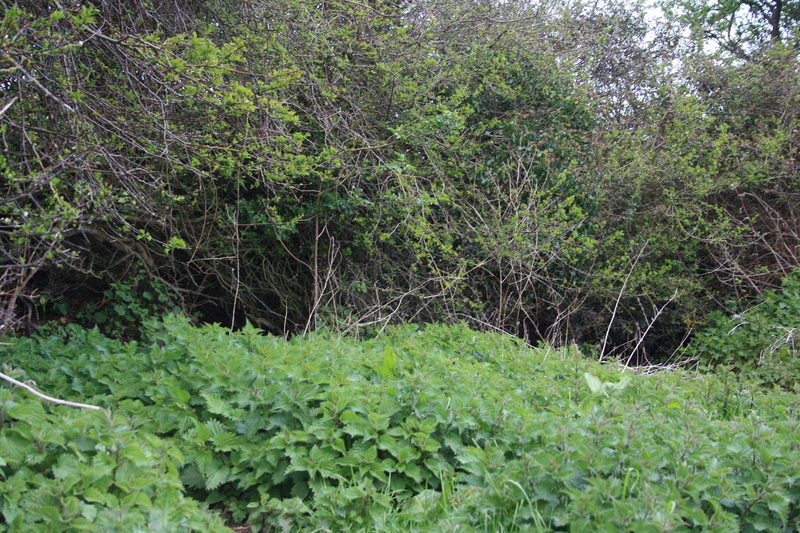 The site is well protected today, on one site by a sharp hawthorn hedge and on the other by deep nettles. However, on getting past these obstacles the well was found to be in a much better state of preservation than I expected. 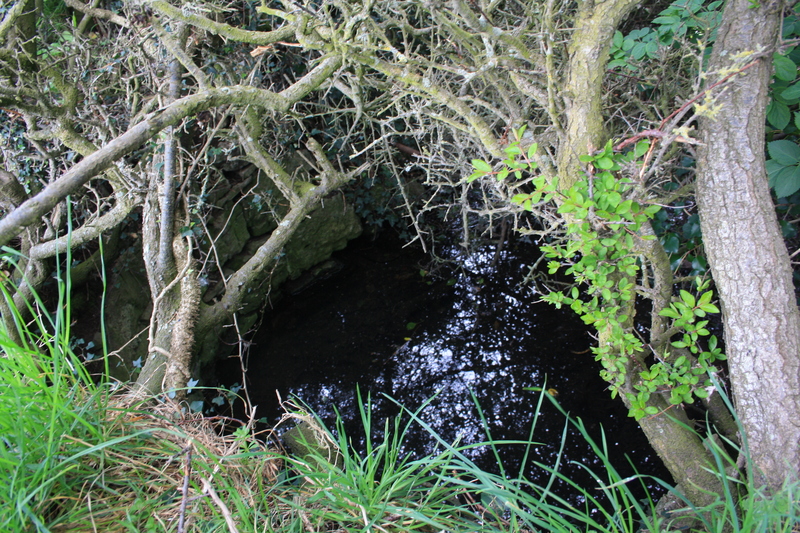 The well lies in the field immediately to the north of the church yard, with a stile across to it from the cemetary. It lies on the edge of a bank along the top of which runs the thorn hedge. There is a well basin, taking the form of a semicircular dry stone wall set into the bank on the hedged side, but which is either less complete or unnecessary on the lower side of the well by the nettle beds. 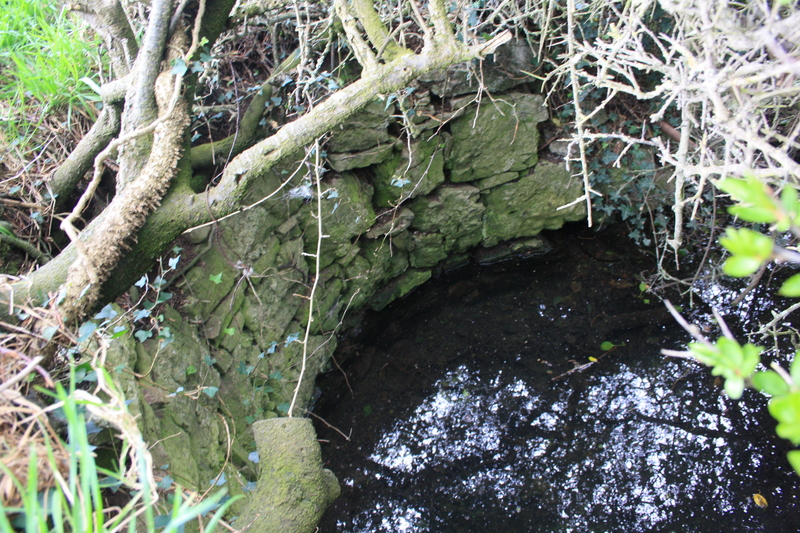 Traditionally the well was resorted to by local residents to petition for the well being of their cattle with the prayer “the blessing of God and the Holy Cynfran be upon these cattle.” This blessing taking place annually on the 11th night of November and again on the Sunday afterwards; the feast day of St Cynfran being celebrated on November 12th. The present incarnation of Cynfran’s church appears to have little of interest, there was a service being held at the time of my visit so I could not go inside. It was largely reconstructed in the late nineteenth century.